In addition to how your feet are positioned relative to the ball, the way you position your feet can also vary, in this case in how they are positioned relative to each other. There are mainly two different sets of options, stance width and foot flaring. The distance between your two feet can and should vary from shot to shot in golf. Indeed, some shots require your feet to be close to one another and others call for your feet to be spaced out far from each other. And other options exist in between those two. Here are the four main distances in between your feet that are useful in golf. In a wide stance, your feet will be furthest apart from each other while still allowing for a full golf swing to be performed comfortably. In that setup, the inside of your feet line up with the outside of your shoulders. 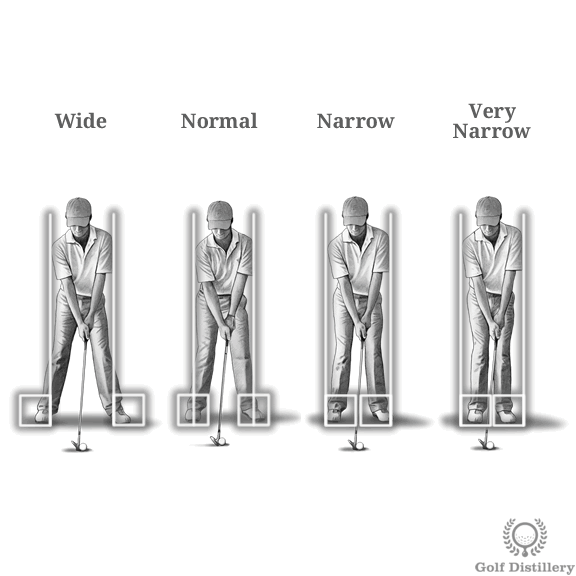 Using a wide stance allows for the greatest stability and is normally reserved for shots made using a driver, where the clubhead is furthest away from your body. Down on the scale you’ll find the normal stance next. That setup calls for your feet to be as far apart as your shoulders are wide. A good visual guide is to see the middle of your feet line up with the outside of your shoulders. Such a setup can be used for most golf shots. Next you’ll find the narrow setup that is normally used for putting and for shots made with wedges. In that setup, you’ll want to see the outside of your feet line up with the outside of your shoulders. Finally, you also have the option of using a very narrow setup at address. You position yourself for such a setup by moving your feet close to one another, almost to the point where they touch each other. 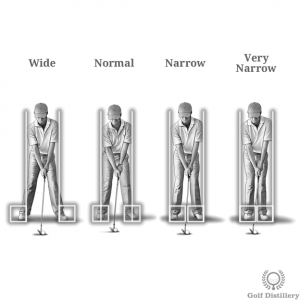 Adopting a very narrow setup is normally associated with very delicate shots that are produced using limited swings. Examples for these are short chips a few feet removed from the green. The way your feet are positioned can vary even when the general location for them stays the same. 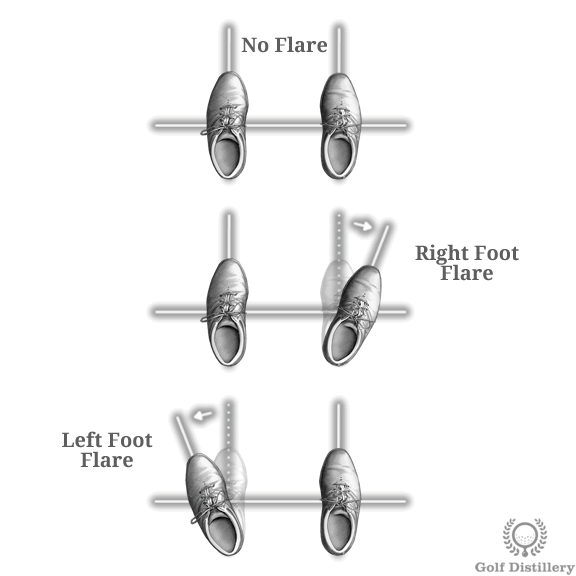 Indeed, you can choose to flare your feet (or foot) in what amounts to rotating them outwardly. There are four options available. The first one sees no foot flaring at all. In this instance, your feet will be parallel to each other and they will cross the target line at a 90 degree angle. Or in other words, the line from your heel to your toes for each feet will be perpendicular to the target line. This foot placement option provides the easiest way to properly align yourself with the target. The second option see your left foot rotated out slightly. Flaring your left foot creates more room for the follow through, allowing you to fully turn after impact. 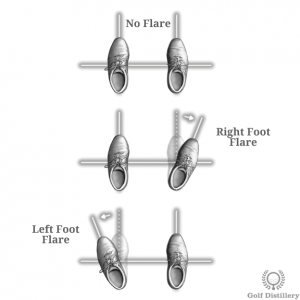 The third option would be to flare your right foot, the one furthest away from the target. 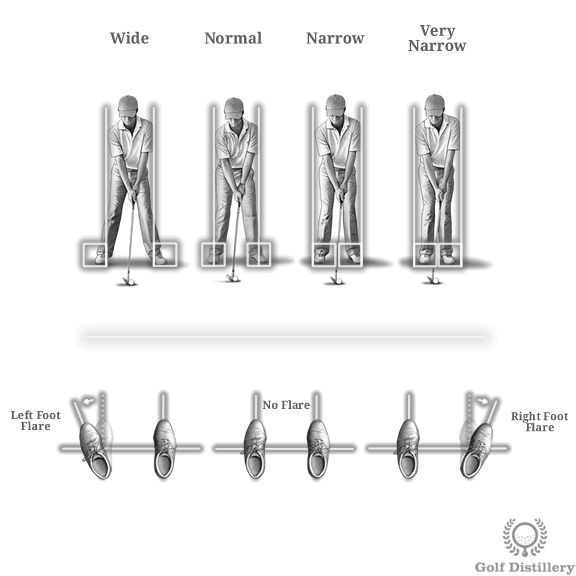 This can be helpful to those who suffer from flexibility issues that make swinging the club back somewhat difficult. Finally, you may opt to flare both feet. While in theory it should create more room for both the backswing and the follow through the reality is that this position shortens your swing amplitude quite a bit, making it difficult to fully rotate in both directions.